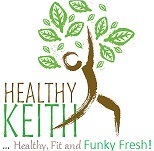 Healthy Keith – Healthy, Fit and Funky Fresh ! Hello world! An intro to Healthy Keith. A man who has been called many things: “Dr. Keith”, Life Coach, Herbalist, Father, Friend, Crazy, Generous . . . I found the default “Hello world!” subject of the first post appropriate and amusing considering my career as a programmer. The journey began a few years ago on a quest to fortify teeth and quell anxiety. Sprouted bread and grass-fed butter became a staple and lemon balm capsules were taken for anxiety only to discover they also aided allergies. The fitness/strength revolution began with an invitation to participate in a Spartan Race. A runner when younger, I never appreciated the need for strength training and had the revelation fairly recently that strength training and flexibility are paramount to any fitness regimen. Self diagnosed high-functioning Aspergers with low latent inhibition, so I absorb/analyze everything, distilling the truth and sharing it with those open to hearing it. It all comes down to a desire to help and heal people, preferably using the “teaching to fish” model so nutritional awareness spreads like wildfire. My hope is that people will learn how to heal themselves through proper nutrition, spread that knowledge, and live more fulfilling lives. Everything is more fun when you’re fit!